There is no adventure than diving. Whether you are novice, or whether you were been diving for so many years, there is always something new, fascinating or challenging about venturing into the underwater world. Your mind may be mesmerized by clouds of colourfully fish, your curiosity raised by the mysterious remains of sunken ships or your creativity awakened by the art of underwater photography. Your diving interests may range from a casual pastime pursued on vacation, to a constant passion, or even a career. Diving offers something new for everyone. You don't necessarily need to know to swim to try diving. As long as you are comfortable in the water and have general good health, you too can dive. The minimum age is 10 yrs, so bring your kids along too and let them experience diving as well. The Discover Scuba Program includes a little basic theory, a few exercises in shallow water and one dive to a maximum of 12 meters with an highly qualified instructor. 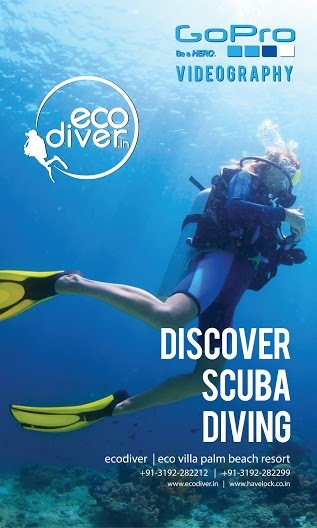 being an Ecological Dive Centre, we do not promote CD/DVD. PLEASE CARRY A PEN DRIVE/MMC / MOBILE PHONE TO TRANSFER PHOTOS AND VIDEOS. CREAMS / LIPSTICKS OR ANY CHEMICALS ARE NOT ALLOWED WHILE IN DIVING.